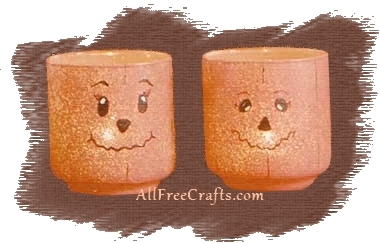 Here’s a Halloween candle craft that you can use to light the dinner table on Halloween night, or to illuminate a side table with a slight orange glow. Pumpkin tea lights, recycled from old drinking glasses or mason jars, are so cheap and easy o make that you may want to paint several extra for the windowsill so that the candlelight can be viewed from outside the house as well. A regular jar or glass can be used for this project. Begin by painting your jar with a sea sponge, by gently patting orange paint over the entire outside surface of the jar. A regular sponge will work but the effect will not be quite as nice as you will get from a sea sponge when the jar is illuminated. Allow the paint to dry and follow paint manufacturer’s instructions, if heat setting the paint is required. Paint a face on the jar with black paint. Here’s where you can get a little creative, and add a different character to each jar. See our face photos for ideas to get you started; small differences in the shape of the eyes, noses, or mouth can alter each tea light significantly. Practice drawing a few faces on paper until you create a design you like, then copy it to the jar. To add a little extra to your design, paint fine lines with black paint around the jar, representing the natural segment lines on a pumpkin. Be careful not to overdo this; faint, slightly uneven lines that are not all alike look best. Insert a tea light candle or votive candle into your glass and you’re all done! Copyright 1999-2013 Susan Spatone All rights reserved.